The Australian Institute of Magic is the latest incarnation of an organisation which has been in existence in Melbourne for almost 25 years. To take a look at where it’s been, what it’s done, and how it got to where it is today, we need to go back to 1984. 1986 – Magic Unlimited runs Australia’s first ‘Festival of Magic’ featuring one hour stage shows by six different magicians together with strolling performers.Iin October that year, we ran the first ‘Magic Week’ – Our Festival of the Magical Arts’ featuring a river escape, poster displays and prop exhibitions at the Victorian Arts Centre and the State Library, magic club (the ASM) open nights, magic workshops, dozens of strolling magicians, performers in nightclubs and restaurants, theatre shows, shopping centre shows, a two-day magic convention, a magic championship, a spook show, plus a major magic show featuring Australia’s top nine magicians. Over 100 events designed to create a greater awareness of magic in Melbourne. 1987 – Magic Week. Staged again in October, bigger and better. 1988 – Magic Week. Now expanding outside of the city of Melbourne into country areas too. 1989 – Magic Week. Now gaining national attention through major publicity stunts and involving almost every magician in the state of Victoria. We also started ‘Magic School’ with Lyndsay Rietschel & Tim Ellis coaching aspiring and established magicians. In October the first issue of the national monthly magazine‘Australian Magic Monthly’ was published and it continued for 100 issues. 1990 – Magic Week. Now an Australia-wide festival with events in every major city. Magic School and ‘AMM’ continued. 1991 – Magic Week, Magic School, and ‘AMM’ continued. We began “non-political” monthly get-togethers for magicians to attend and created ‘MagicSports’ for these events. 1992 – Magic Week, Magic School, and ‘AMM’ continued. 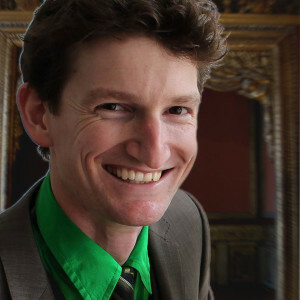 Tim Ellis acted as Vice President and organiser of the ‘Australian National Magic Convention’. Free monthly magic nights became known as‘Showcase Sundays’. 1993 – Magic Week, Showcase Sundays, and ‘AMM’ continued. 1994 – Magic Week, Showcase Sundays, and ‘AMM’ continued. We created and ran a Magic Course for Adults at Swinburne University. 1995 – ‘AMM’ continued. ‘Magic at Mietta’s’, a series of late night close up shows starring many local magicians, took place. 1996 – ‘AMM’ continued. 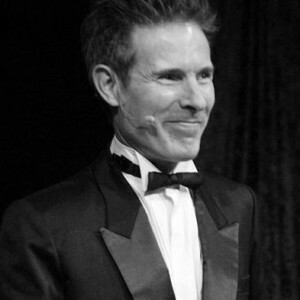 Tim Ellis was President and organiser of the ‘Australian National Magic Convention’. Magic Unlimited helped develop and co-ordinate a Japanese NHKTV Aussie magic special. 1997 – ‘AMM’ continued. Magic Unlimited staged the ‘Bryan Wood magic lecture’ in Sydney. 1998 – ‘AMM’ continued. Magic Unlimited produced the ‘Dreams & Illusions’ stage show. 1999 – Magic Unlimited produced a 3 hour New Year’s Eve show. 2000 – As no other publication had surfaced to replace AMM, Magic Unlimited published ‘AMM 2000’ for one year only. We produced the ‘Cunning Stunts’ show for the Melbourne International Comedy Festival. Monthly magic nights began again as ‘Magic Studio Nights’. 2001 – ‘Magic Studio Nights’ continued. 2002 – Magic Studio Nights evolved into ‘Melbourne’s Magic Nights’ at Cooper’s Inn with up to 80 magicians attending each month for sessions, workshops, lectures, tutorials, competitions and theme nights. 2003 – Magic Unlimited brought ‘The Flicking Fingers’ to Australia for two Weekend Conventions in Melbourne and Sydney. ‘Melbourne Magic Nights’ continued. 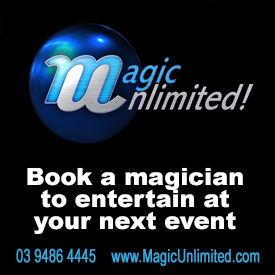 2004 – No magic club was willing to run the event, so Magic Unlimited produced the Australian National Convention on it’s own, bringing out guests Henry Evans, Aldo Colombini, Lee Eun-gyeol and Norbert Ferre. A team of magicians from Magic Unlimited perform The Worlds Longest Magic Show and enters the Guinness Book of Records. ‘Melbourne Magic Nights’ continue. 2005 – Magic Unlimited stages The Halloween Spooktacular. Monthly Magic Meetings recommenced. 2006 – The monthly meetings are renamed Magic Unlimited Group Sessions (MUGS) continue on a twice monthly basis, and MUGS founder and President Sue-Anne Webster officially has the group affiliated with FISM. 2007 – MUGS continues to meet twice a month at the Trick or Treat Magic Cafe. 2008 – MUGS is renamed and incorporated as The Australian Institute of Magic. Later in the year they stage the first ever Melbourne Magic Festival at the Northcote Town Hall. 2009 – The Australian Institute of Magic stages the second annual Melbourne Magic Festival at the Northcote Town Hall. AIM also produces two charity performances to raise funds for the Black Saturday Bushfire Appeal. 2010 – The Australian Institute of Magic stages the third annual Melbourne Magic Festival at the Northcote Town Hall. 2011 – The Australian Institute of Magic stages the fourth annual Melbourne Magic Festival at the Northcote Town Hall. 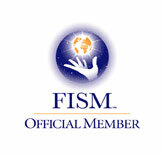 AIM also hosts the first Oceania Championships of Magic as an Official FISM event. 2012 – The Australian Institute of Magic stages the fifth annual Melbourne Magic Festival at the Northcote Town Hall. 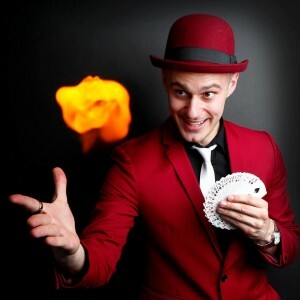 AIM send’s Simon Coronel to the FISM world magic championships in England where he won “Most Original Close-Up Act”. 2013 – The Australian Institute of Magic stages the sixth annual Melbourne Magic Festival at the Northcote Town Hall including a spectacular dual Straitjacket Escape by Wayne & Fran Houchin, and the Opening Extravaganza Show at the Darebin Arts & Entertainment Centre. AIM auspices The Geelong Magic Circle to produce ‘Matinee Magic’ at the Geelong Seniors Festival. 2014 – The Australian Institute of Magic stages the seventh annual Melbourne Magic Festival at the Northcote Town Hall including special international guests Dan Sperry, Jay Scott Berry and Eric Jones. AIM auspices The Geelong Magic Circle to produce ‘Matinee Magic’ at the Geelong Seniors Festival. 2015 – The Australian Institute of Magic stages the eighth annual Melbourne Magic Festival at the Northcote Town Hall including special international guests Pop Haydn and Rob Zabrecky. AIM auspices The Geelong Magic Circle to produce ‘Matinee Magic’ at the Geelong Seniors Festival. 2016 – The Australian Institute of Magic stages the ninth annual Melbourne Magic Festival at the Northcote Town Hall including special international guests John Archer and Max Maven.